Aoife Tobin, of the Department Linguistics and English Language at the University of Sussex is doing research into the extent and impact of verbal memory and language processing problems for people with ME/ICD-CFS. Aoife has released a large-scale online questionnaire, and will be surveying people with ME/ICD-CFS in one questionnaire, and their carers and close relatives in another (a third will question healthy controls). Aoife would also like to focus on the 'Canadian Guidelines' document for diagnosis, to try and make sure that she is seeing the neurological condition of ME, rather than patients with other debilitating conditions who have found themselves lumped under the diagnosis 'CFS', and she is also keen to have a self-rating % scale of illness, as is frequently used within ME communities, to see if the impact of language processing problems correlates to the severity of other symptoms. Aoife says: “In my research I want to collate and analyse self-reported information from people with ME, and perhaps comparing to more common or more analysed forms of aphasia and language processing difficulties. What I've seen so far has similarities in presentation to Broca’s aphasia, for example, which can be caused by damage to the basal ganglia; interestingly, the basal ganglia have been found to be inflamed or swollen in some people with ME. I would like to see how commonly reported verbal memory and language processing problems are people with ME; in what situations they forget words, and ask what types of words they tend to forget (is it, as I suspect, usually naming-words that go missing from the individual's lexicon), whether they confuse words, and what nature of confusion occurs (similar sounding words, similar meaning words, substituting antonyms instead of the word they want). 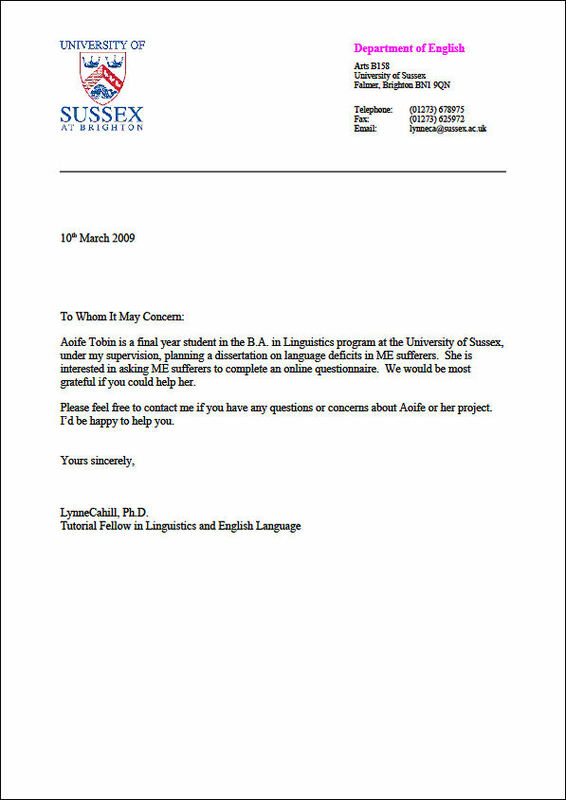 It would be helpful if people could report actual examples of aphasia experiences, and I would also be interested in hearing about what coping strategies patients are developing (describing the object instead of using the name, using near-synonyms for the word, using fillers like 'thingy' and 'whatsit', using a different language). An introduction from Aoife’s supervisor is documented below.